Ah, yes, old can of worms that is national identity. I totally agree with your frustration, Steph. Surely there must be some commonalities among Canadians? And I think there are when it comes to values – things like multiculturalism, open-mindedness, and accessible health care. Which is actually why I was happy to hear Jian mention health care. Good to a Fault would have been a completely different story in the U.S. 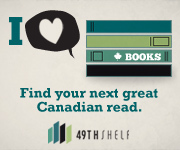 But really as I was listening to the debates today, I rephrased it in my mind to “Which book would you consider a faithful representation of Canada?” Like if you wanted to give a foreign guest a book that represented Canada and CanLit, what would it be? And I think that has less to do with hockey or geography than with its values and sensibilities. And, yep the program definitely goes by too fast. It’s only about 22 minutes anyway, and take out all the intros and the theme music and there’s not a lot of time for debate. I like how you rephrased that question. I’ve been thinking far too superficially; I’m seeing this more and more as I talk with people. At the same time as Can lit does tend to feature Canadian landscape/cityscape as a prominent character in many books, I think you’re right that Canadianness or any other country’s essence has more to do with values and sensibilities than with more tangible things. And I actually don’t have an immediate answer, then, in terms of which book best represents that. What do you think? Haha! I know what you mean! Imagine the debates if they were just on this one question!